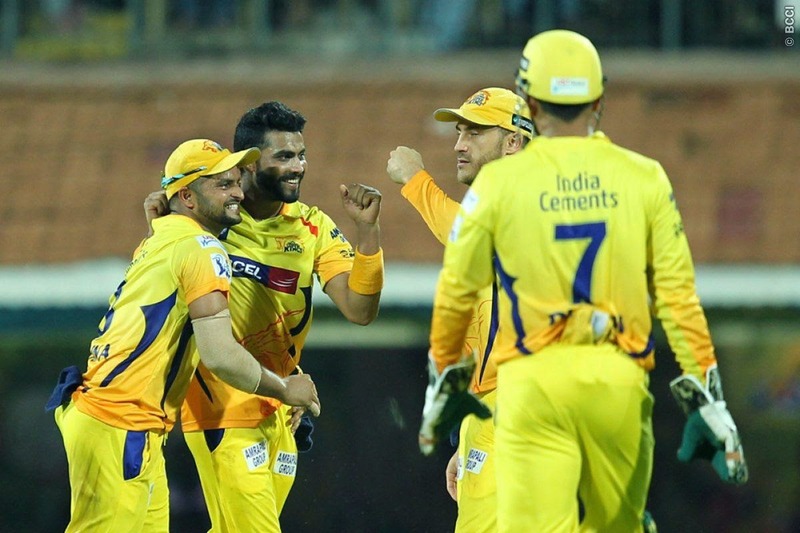 The Chennai Super Kings turned the heat on at the Chepauk and outclassed the Kings XI Punjab triumphing by an overwhelming margin of 97 runs. This comprehensive victory owed a lot to a stupendous show put up by the Super Kings, in all the three departments. On the other hand The Punjab franchise looked out of sorts and of no match to their opponents, as they failed even to reach a three digited score while chasing. The Men in Yellow, winning the toss elected to bat first at their home ground with a side well equipped with high quality batsmen. The dynamic duo of Dwayne Smith and Brendon McCullum, who have been in sublime form since the beginning of the tournament and tasted a lot of success, gave their fans a reason to cheer out loud yet again. The pair got their team off to a flyer, assuring addition of at least two boundaries in each over to add to their total. Smith in the second over amassed 22 runs thrashing Karanveer by some colossal blows. The display of some exquisite hitting by both the batsman lasted only till the 4th over, as in the 5th over Smith fell prey to Anureet Singh who blew away his leg stump and had to walk back for 26 off 13 balls. 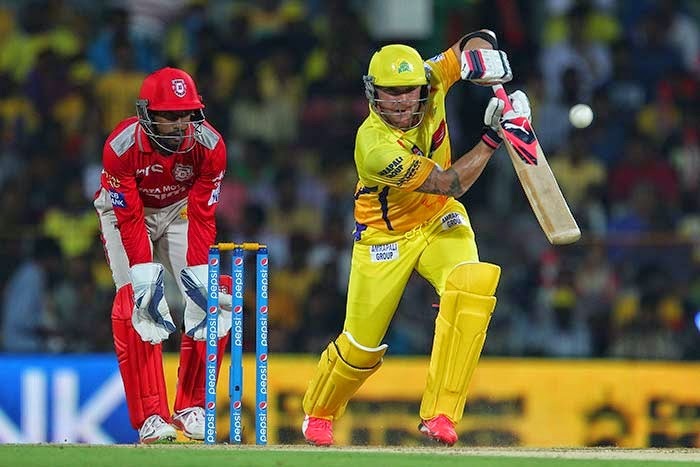 Brendon McCullum did not put a brake after his partner departed, instead was more pumped up and took the charge to the bowlers, the result of which as a score of 97-1 at the end of 10 overs of play. The blazing knock if McCullum came to an end in the very first ball of the 12th over as he hit a ball off Axar Patel which was caught by Miller at long off, and departed for 66 runs off 44 balls hitting 8 fours and 3 massive sixes. His presence had wilted the Punjab camp to pressure the proof of which was Mitchell Johnson dropping two catches and his departure was a much needed breakthrough for them. 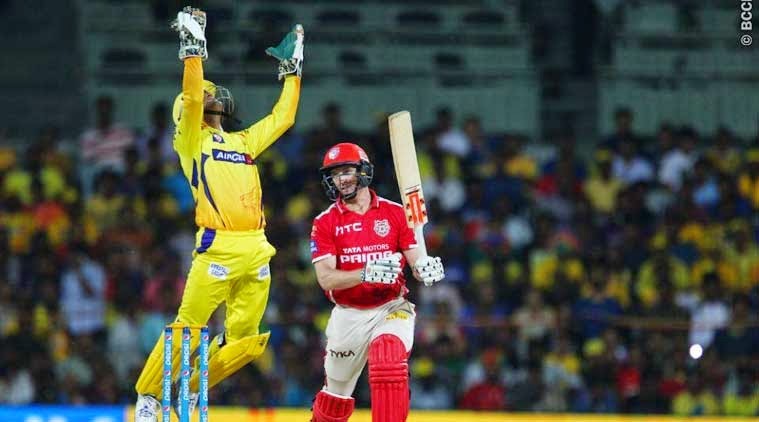 Dhoni one of the most acclaimed finishers in the game, yet again showed his capabilities as he launched a volley of blows into the crowd and accelerated the run flow. No bowler looked impressive and 200 was well within reach, but Sandeep Sharma bowled brilliant last over, restricting the Super Kings at 192-3. Dhonj remained not out contributing an essential 41 runs off 27 balls to his team's score. The Kings XI Punjab's bowling card had nothing worthy to display in terms runs leaked except for Sandeep Sharma's figures of 32 runs in 4 overs although he went wicketless. Chasing a score as humongous as 193, the Punjab needed to explode, however their batting seemed to have driven inspiration from their docile bowling. The batting line up fell like a house of cards, surrendering to a top notch bowling attack on the day. The Chennai team started tightening the screws right from the first over removing Sehwag for just a run. Shaun Marsh the hero of the King XI in the previous match returned for 10 runs in the 6th over. It was just a matter of time George Bailey, David Miller and Murali Vijay returned to the pavilion, as their team was reeling at 55-5 at the close of 10 overs. Miller was victimized off a ball of Jadeja, credits to Raina who caught a stunner. Already staring at a huge defeat ahead, no one showed signs of even fighting to reach a respectable score. Batsmen kept slipping and eventually the match from the hands of the Kings XI did too. They ended up at 95-9 at the end of play of 20 overs, much unlikely when one would think of their previous edition's performance. The bowling department of Chennai was exceptional. The spin duo of Jadeja and Ashwin did the damage, together picking up 5 wickets and giving away merely 36 runs in their 8 overs. Nehra picked up 2 scalps while Mohit chipped in with a wicket too. Brendon McCullum was adjudged the man of the match for his marvellous knock. Super Kings nearly embarrass the Kings XI in an easy victory.